CEME is delighted to again be hosting Havering Business Awards. 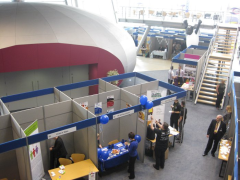 The Havering Business Awards are widely recognised and sought after. Winning this award offers exceptional marketing and PR opportunities, as well as increasing credibility. CEME Conference Centre – winner last year in the Customer Care Award category, is proud to be the official host of the award for the third time! Eamonn Cole FIH, CEME’s Conference Centre Director added, ‘ The Havering Business Awards do so much to recognise and reward businesses within the region from small start-ups to larger established companies all of whom demonstrate the enthusiasm and professionalism needed to succeed within the current economic climate. It really is a privilege for CEME to again be hosting such a prestigious evening’.